CJ and his nana ride the bus together on Sundays but CJ wishes they had a car instead. That is, until Nana points out why riding the bus is so much better. Last Stop on Market Street is simply enchanting. It is filled with musical and sensory language, as evidenced by my favorite line: "Sometimes when you're surrounded by dirt, CJ, you're a better witness for what's beautiful." 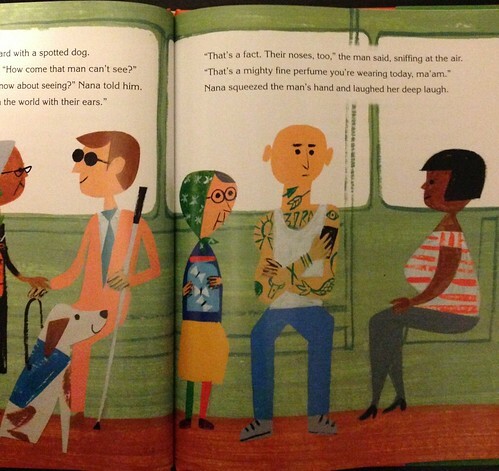 I loved the childlike yet poignant illustrations by Christian Robinson and I especially loved this illustration of a little babushka who is sitting next to an imposing (but also endearing) tattooed dude on the bus. 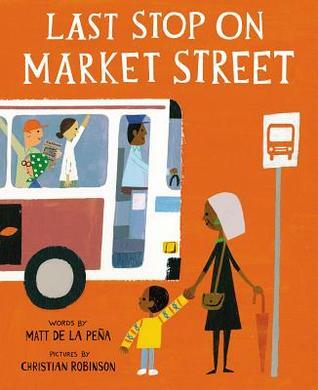 Fans of Lauren Castillo's Nana in the City will also be delighted by Last Stop on Market Street. I love that illustration, too! That's exactly what riding the bus is like!